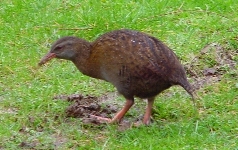 Wekas (Gallirallus australis) are an endangered flightless bird, slightly smaller than the kiwi. The Islands of New Zealand have been remote from any major landmass for millenia so the native wildlife consisted of creatures which could fly or swim here - there were no mammals here besides bats and seals until the first arrival of humans possibly only about 1600 years ago. In the absence of mammalian predators, many species of ground-foraging bird lost the redundant ability to fly - some Moa stretched to over 3metres (10 foot) tall. The first people here brought with them dogs and rats. When europeans arrived they brought cats, rats, ferrets, weasels, stoats, and possums. Most native flightless bird species were soon extinct. Of the four remaining, 2 are extremely rare, and the Kiwi is steadily declining (see my Kiwi Rant). 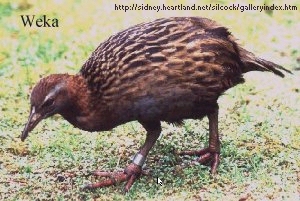 Only the weka seems to be holding its own - although in much reduced numbers and marginalised to only a few areas of the country - and recently another site states that weka are now rarer than kiwi. Ka-WEK! ka-WEK! ka WEK! ka-WEK!... (Sound recording at Kiwi Wildlife Tours NZ). So 2002 was the year of the stoat (at Mt Elliot). I saw them everywhere, and marvelled at their size. Were it not for their dun colour with white bibs, i would have sworn there were ferrets about (the buggers can move fast when they want to - chasing one i spotted crossing the paddock, i didn't gain fast enough in my gumboots before it gained cover and disappeared). The rat boom was soon eaten - and then hordes of hungry stoats hunted harder game. 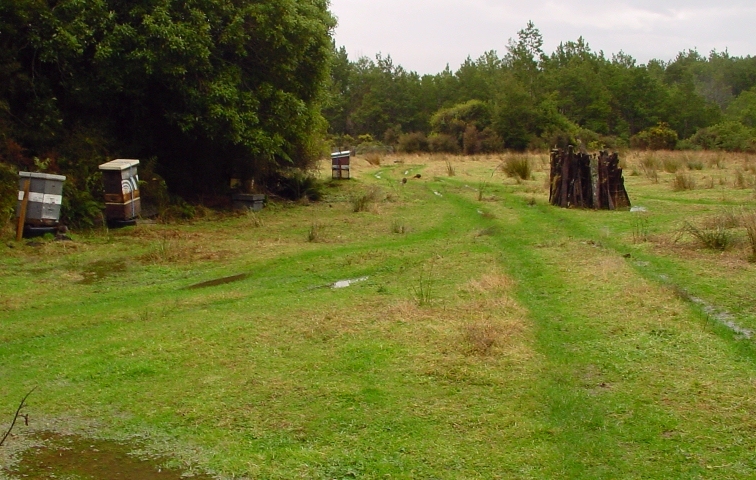 The flightless kiwi was hit even in controlled areas where DOC (Dept of Conservation) intensively traps stoats to help kiwi survival - at Okarito kiwi area, no chicks were recorded as surviving that year. Rat-hunting weka are generally accepted to be able to fend-off stoats, but with the overwhelming number of stoats about, and little else left for stoats to eat, the weka disappeared too. From seeing family groups in a variety of places, i now saw no wekas. From hearing multiple calls ringing-out all around, Kawek voices were reduced to a solitary weka calling repeatedly, without the faintest reply when i froze to listen. So it was for months, even after the stoat population crashed again (i guess they crashed because there was no stoat food left). Driving the highway to Christchurch i still saw the odd weka elsewhere, where the Beech was not so predominant and the area had escaped the extreme chain of events, but it was not until this spring that i was able to hear the odd distant reply to my single survivor. 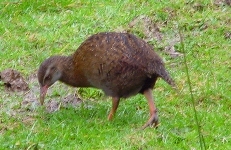 Then one day whilst digging, i was joined by a weka who worked-over the disturbed soil, picking for easy bugs. 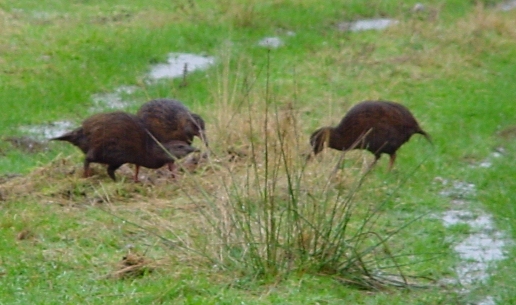 Weka are quite bold, coming to within feet even when they haven't learnt to work a crowd. And next time i looked the weka was on the other side of me, but wasn't it now... smaller? As i worked, the weka appeared from cover randomly around me, but i never saw more than one at a time, and i couldn't be sure if it was the same one each time? 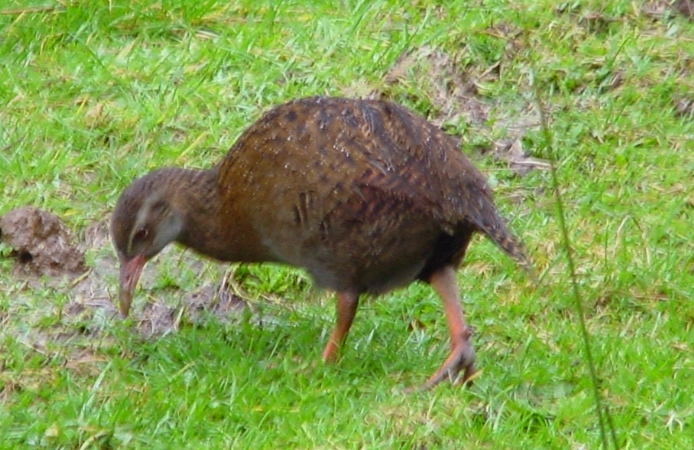 And then in February 2003 the last night caller fell silent, and i didn't see or hear any weka nearby. Until early June, when i started seeing a weka around my shack - and when it called there was a synchopated reply from the immediate vicinity. I was only seeing one, but suddenly there were unmistakably 2 wekas here again. The following week was WET. It rained and rained as the West Coast is infamous for - conditions wekas seem to like (and many mammals do NOT). The Kaweks were very vocal - and in the ruckus it almost seemed like there were MORE than 2 birds calling. One mid-afternoon chorus sounded close-by, and peering down my sodden 'driveway', i could see there were indeed 2 birds working over the worms that fled drowning. I hadn't seen a pair of Kaweks for over a year, so i grabbed my camera and went in closer (unfortunately due to the continuing 'moist' weather the photos are not as clear as i normally expect). I soon realised that there were at least 3 birds. One of them was very flighty at my approach, so i kept a fair distance, and observed that 2 of the birds would ocassionally bring food to the nervous one, which seldom seemed to find worms itself despite probing like the others, and made quiet high-pitched peeping sounds. Obviously a family group, with a near full-grown chick. The feathers around the head of the youngster were a little mottled, but it was essentially full-size and fully fledged - these guys had been raising a family nearby for many weeks - in silence. I tried to slowly work my way closer, but the youngest took fright, and ran into the cover, to be accompanied by one of the parents. Without junior to look after, the remaining adult was brash and confident as normal, wandering around the place at will. My rescued domestic fowl who were avoiding the rain under an old van, looked on and would not venture out to challenge their wild cousin as it brazenly plundered their scratching ground. Though they needn't have been afraid (chickens!) - when i did observe a chance close meeting between weka and chook, it was the wild bird who had the quicker instinct to run away. With all the rain, the track was quite churned-up, and this made easy pickings for a weka. 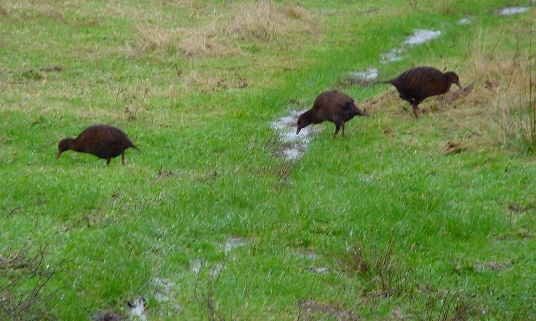 Rain seems not to get through their feathers, and i wonder if this is the main reason why weka still persist on the Wets Coast while they have disappeared almost everywhere else. Certainly NZ has plenty of other native forests still, but drier areas are better suited to their mammalian predators - ferrets (larger relative of the stoat - also introduced) are common on the eastern (drier) side of the Island - former weka habitat but now rare there. In the North Island the local weka is almost extinct, and DOC policy doesn't help either, following a racially pure dogma that will not allow the introduction of the South Island weka to the north, even though some hybrid vigour from successful south island genes may be just what the north island breed needs (Such madness extends to our national emblem too - recently a private wildlife sanctuary was forbidden from releasing excess kiwi that had bred up there, because they were of mixed race - how nice to know they'll still be pure bred when they finally go extinct). It's disappointing to me that a department which is supposed to work for the environment regards racial purity as more important than ensuring there are weka about, filling their appropriate niche in the ecological web. Hopefully the local Kaweks will be okay now, and we won't get such an extreme chain of events for a good few years, allowing their numbers to build back up again - so i should be able to take some nice-weather photos without a fogged lens! Meantime the unusually warm winter continues to bring rain, dampening the lifestyle of the local mammals... including me.